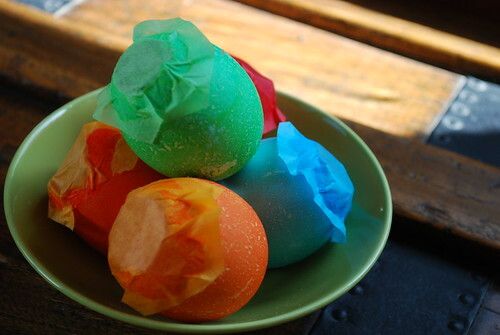 Inspired by Scrumdilly-Do!, we made cascarones for easter. Totally fun! You’re supposed to crush them over someone’s head but we were all a bit on the timid side for that. But they are great fun to smash and toss in the air. I think they need to become a tradition around here. We died them with some of the left over kool-aid egg dye and filled them with freshly made hole punches. Had I thought ahead I would have just emptied all the hole punches as the office. There’s always next year. i love that you just glued matching tissue on the bottom…these are really cute anna…maybe several easters from now we could have a date to make the chocolate version, i think i’d need a lot of moral support to get those babies made up. 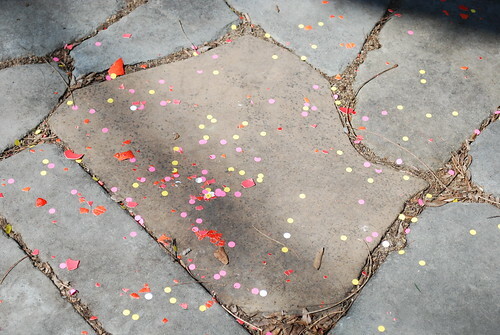 I actually didn’t clear away the confetti. Sounds bad and pulls on my 70s “give a hoot” philosophy. But in reality we only had 5 or 6 eggs and they didn’t contain tons of confetti. So the bits of paper and eggshell just blew into the lawn. The rain today should make quick compost of the paper. 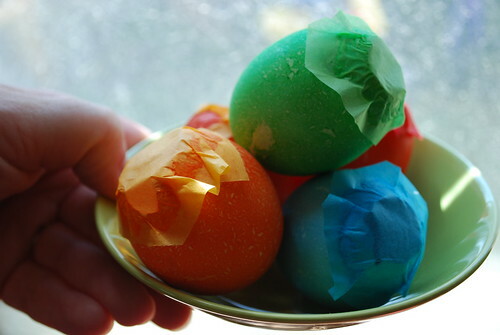 The same will happen with the eggshells over a bit longer time or the birds will eat them. I’ve read that birds will actually eat eggshells for the extra calcium this time of year – and these are kool-aid flavored! how awesome! i had never heard of cascarones until today, and they look like so much fun to make, and break!